This offer will run from 09 May 2019 to 22 April 2019! So, don’t miss your opportunity. 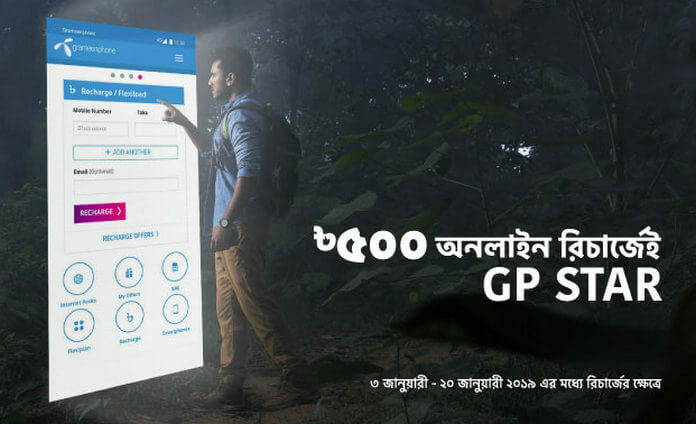 Grameenphone STAR Program is the allegiance program, expected to offer and appreciate its high-value customer as the most important one. GP STAR customers are provided special offers that are not offered to others. How To Check GP STAR Status? You can check your star subscriber status by USSD or send message. Recharge 500 Taka from online channels (Website, MyGP, Easynet). To avail, this offer GP customer needs to recharge a minimum of BDT 500. Recharging validity 09 May 2019 to 22 April 2019. This STAR status will be provided for the next 90 days, i.e. 9 May ’19 to 6 August ’19.